This questionnaire was designed by our skin specialists to help determine the best products for your skin type—including deciding whether or not you need a serum at this point in your life. At the most basic, pared down level, you should be following a regimen that includes a cleanser, toner, eye cream (from your 20s on), moisturizer, exfoliant, and mask. Anything additional would be prescribed based on concerns to help you achieve skin goals. That oil-free hydration comes by way of Glycerin, a classic humectant that works to deliver essential moisture without feeling heavy on skin. Key ingredients like Salicylic Acid and Thyme Extract work help encourage clearer-looking skin. How to use Anti Acne Serum: This clarifying serum is meant to be used every night or as needed. Before bed (after you’ve cleansed and toned), apply a thin layer on troubled areas. Anti Acne Serum is designed to be worn alone, in place of a traditional evening moisturizer or night cream. Herbal Hydrating Serum will leave your skin looking dewy and fresh-faced. Ceramides, Ginkgo, and Ginseng are infused to revive, soften, and smooth—making this unique gel a versatile staple in all skin care regimens. It’s water-light in texture and oil-free in formulation, which enables you to effectively hydrate without leaving your T-zone feeling like an oil slick. How to use Herbal Hydrating Serum: For the super oily, wear this serum on its own in place of a moisturizer. All other skin types can still use this serum, though: simply apply a thin layer over moisturizer/night cream for enhanced hydration and glow. DULL WITH UNEVEN SKIN TONE? Vitamin C Serum will be a game-changer for lackluster complexions seeking a boost in radiance. This is a lightweight serum that helps restore youthful luminosity to skin while delivering antioxidant defense against environmental stressors and skin-aging free radicals. It’s powerful in formulation, but absorbs seamlessly into skin to help brighten uneven skin tone and reduce the appearance of dry fine lines. Vitamin C, Collagen, and Sodium Hyaluronate combine to diminish the appearance of wrinkles and uneven skin tone—leaving all skin types soft, smooth, and glowing. How to use Vitamin C Serum: Apply 3-4 drops to clean skin every other evening. Follow with your favorite night cream. Apply Cellufirm Drops under your daily moisturizer or night cream. Uniquely versatile and designed to help reduce the look of fine lines and wrinkles, this serum is a must-have for dry skin. Antioxidant oils soften and nourish as a protein-enriched blend of Collagen. Elastin, RNA, and peptides works to give skin a supple, youthful appearance. How to use Cellufirm Drops: Apply a few drops to targeted areas that need extra moisture, or apply 4-5 drops all over your face and neck for maximum skin-smoothing benefits. Follow with your daily moisturizer or night cream. #MBSkinTip: Cellufirm Drops can be used under and around the eye area under your eye cream, too! Revive dehydrated skin and smooth dry patches with Rose Hips Nourishing Oil. This lightweight yet moisture-intensive facial oil is infused with Rosehip Extract and Rosehip Oil—both known as great sources of essential fatty acids and antioxidant Vitamin C—to provide comforting moisture and reveal softer, more radiant skin. How to use Rose Hips Nourishing Oil: Massage 2-3 drops on clean skin. Or, apply 1-2 drops to dry patches that need a targeted moisture boost. Follow with moisturizer or night cream. #MBSkinTip: Roll up your sleeves and customize your glow. Mix a few drops of Herbal Hydrating Serum and Rose Hips Nourishing Oil to get your perfect dewy skin concoction. Use more of the blue when you want to keep it light, or mix in more oil to give your mixture slip and added moisturizing benefits. DRY WITH FINE LINES AND WRINKLES? Try Hyaluronic Emulsion with Vitamin C or Corrective Complex Emulsion. 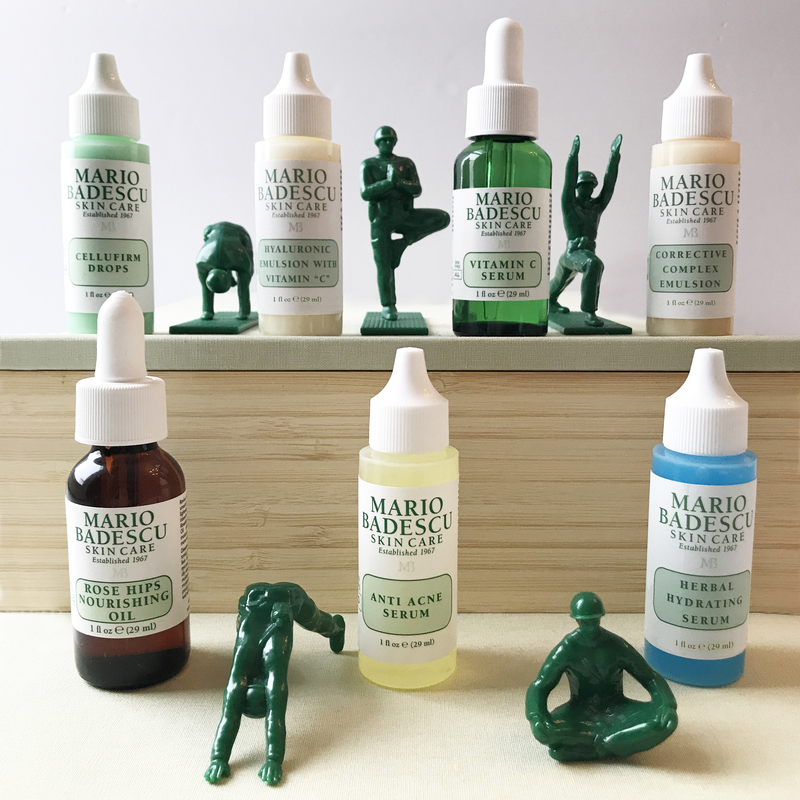 Both serums have a lightweight slip that absorb beautifully into skin. Hyaluronic Emulsion with Vitamin C is designed to boost moisture and give depleted skin a more youthful, hydrated appearance. Corrective Complex Emulsion also boasts nourishing ingredients to soften and smooth skin, but also contains Oligopeptide-5 for an added anti-aging boost. How to use both emulsions: Apply 2-3 drops on clean skin, then follow with night cream. Incorporate Peptide Renewal Serum into your routine to target visible signs of aging and deeply nourish skin. This complex blend of Peptides, Sodium Hyaluronate, and complexion-boosting botanicals is specially formulated to improve the look of depleted, mature skin and reduce the appearance of dry fine lines and wrinkles—leaving the complexion soft, smooth, and supple. How to use Peptide Renewal Serum: Because of its rich consistency, less is more with this product. Apply 1-2 drops on your face, neck, and décolleté. Wear it alone or layer it under your favorite face cream or night cream.